This certificate with coupons is framed in our classic, wood frame which is 1 1/4" wide with an overall size of 20 1/4" x 20 1/4". Double matting, archival mounting, acid free backing and clear glass are used in framing this certificate. The price includes the classic gold frame, heavy duty packaging, and USPS priority, insured mailing in the continental U.S. Mailing to Alaska, Hawaii and international destinations is available at actual cost. 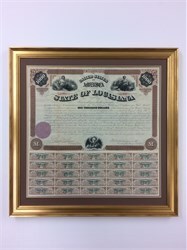 Beautifully engraved uncancelled $1,000 Bond Certificate from the State of Louisiana issued in 1871. This historic document was printed by the National Banknote Company and has an ornate border around it with a vignettes of Agriculture and Commerce. This item has the signatures of the State's Governor, Henry Clay Warmoth and Secretary of State, George E. Bovee is over 137 years old. 74 coupons attached to bond only 5 coupons shown in scan. The bonds were issued to the New Orleans, Mobile and Chattanooga Rail Road or Bearer. Henry Clay Warmoth epitomizes the corruption of Louisiana politics during Reconstruction and at other times as well. Elected Governor at age 26 as the Republican candidate, Warmoth speculated in state bonds and treasury notes, profited from part ownership in the newspaper which held the contract for state printing, and created the State Returning Board to supervise election returns. The Board had the power to throw out votes from any precinct thought to have tainted results. Radical Republicans used the board to maintain power by enabling them to steal elections from the Conservative Democrats. Although he supported voting rights for blacks, Warmoth prevented other civil rights provisions from becoming part of the Constitution of 1868. He led a faction of the Republican Party in Louisiana which opposed the faction loyal to President Ulysses Grant. Warmoth's group allied itself with the Democrats in the controversial election of 1872, supporting John McEnery over Grant's candidate, William Kellogg. For his role in the fraudulent election, Warmoth was impeached but never brought to trial. Warmoth lived 60 more years, staying active in Republican party politics. He died in 1931 in New Orleans.